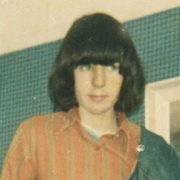 The family of Manus Deery has won a fresh hearing into the fifteen-year-old’s murder in the nationalist Bogside area of Derry in May 1972. 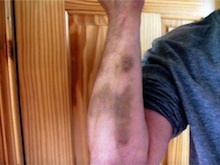 A west Belfast man badly beaten by a gang of loyalists on Black Mountain earlier this week says he is lucky to be alive. Jailed political dissident Marian Price was moved to an outside hospital last weekend without her consent, her family have said. 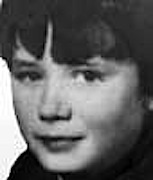 An inquest has been ordered to be reopened after new evidence was uncovered about the death of the first child killed by a rubber bullet in the north of Ireland. Sinn Féin’s Martin McGuinness met and shook hands with British monarch Elizabeth Windsor today, both in private and in the presence of an official photographer. 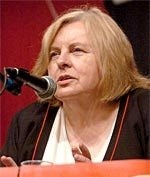 The unprecented event has provoked protest and division among Irish nationalists and republicans. Rioting erupted in west Belfast last night ahead of an unprecedented meeting later today [Wednesday] between Sinn Fein’s Martin McGuinness and British monarch Elizabeth Windsor. 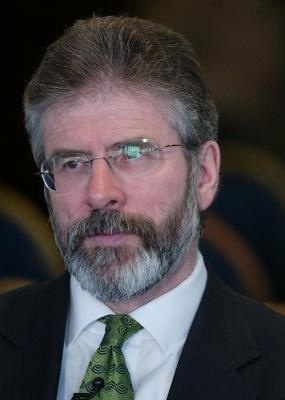 Amid an outcry among Irish nationalists and republicans, Sinn Féin President Gerry Adams has today issued a statement in support of his party’s decision to give the go-ahead to a meeting and handshake between Sinn Féin’s Stormont Deputy First Minister Martin McGuinness and English queen Elizabeth Windsor. Sinn Féin’s Martin McGuinness is to meet the British monarch Elizabeth Windsor during her visit to the north of Ireland next week, it has been confirmed. McGuinness, a former IRA commander, is to meet Windsor, the commander-in-chief of the British Armed Forces, at a reception to celebrate the arts in Ireland. Interned Irish political dissident Marian Price has been moved from Hydebank Prison to a hospital in Belfast this [Friday] morning. 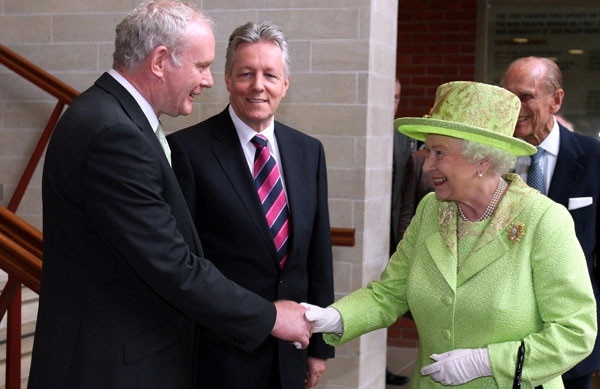 Sinn Fein has still not ruled out the participation of Martin McGuinness in events surrounding the visit by the British queen and commander-in-chief, Elizabeth Windsor, amid speculation that a deal may already have been done on the matter. A referendum on children’s rights is to go ahead in the 26 Counties following a devastating report that found that the deaths of almost two hundred children who were in state care could have been prevented. The 32 County Sovereignty Movement have blamed British intelligence for planting a tracking device on the car of one of their members in Derry. A controversial loyalist parade takes place tonight, and there are fears of potential trouble as the parade passes nationalist communities in north Belfast, particularly around North Queen Street. 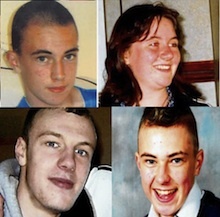 Some families of people shot dead by the British Army have found clear evidence that British soldiers were given a green light to shoot and kill civilians in the north of Ireland. 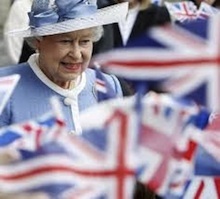 Sinn Fein has said it was caught off guard by the announcement last Friday that the visit of British royal Elizabeth Windsor to Stormont later this month will involve a giant celebration by tens of thousands of unionists. Under pressure from the Dublin government, the Economic and Social Research Institute (ESRI) has censored its own economic report which said a huge proportion of Irish workers fall into the category of working poor. 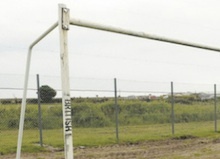 Loyalists who hacked down Gaelic football goalposts at a County Down pitch and branded them ‘British’ are intent on driving Catholics from the area, a local Sinn Fein councillor has said. 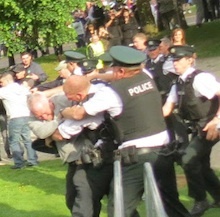 There was a “vicious” assault by the PSNI against a local republican during a stop and search operation in Newry last week, according to eirigi. Amid protests over continuing sectarianism in unionist-controlled councils, an Ulster Unionist councillor has said “pigs will fly” before there is a Sinn Fein mayor of Antrim. The 26-County Justice minister Alan Shatter appeared to confirm his government’s unionist credentials this week he referred to the city of Derry as “Londonderry”. 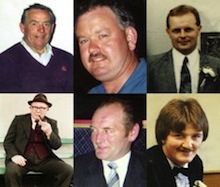 For 12 years the Loughinisland families silently mourned the loss of their loved ones. They kept that silence, they say, because of police assurances that no stone would be left unturned in the hunt for the killers. Sinn Fein MP for Mid Ulster Martin McGuinness is to resign his seat, forcing a Westminster by-election, as part of an overhaul by Sinn Fein’s of its elected representatives. 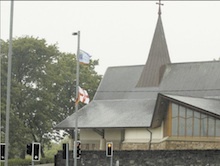 Vigilante group RAAD have claimed responsibility for a grenade-style attack on a PSNI patrol in Derry during aggressive Crown force raids in the nationalist Creggan area last weekend. 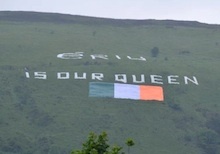 While Sinn Fein’s Martin McGuinness appears set to personally welcome a British monarch to the north of Ireland later this month, others have said they plan to protest the visit. European officials have already taken advantage of last week’s 26-County referendum result by curtly dismissing calls by Taoiseach Enda Kenny for a new deal on the state’s banking crisis. The family of former Sinn Fein councillor Brendan McConville has called for the Stormont administration to recognise a miscarriage of justice following his recent conviction for a Continuity IRA attack three years ago. 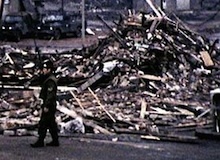 A former British army information officer has said that a loyalist massacre was blamed on the IRA in 1971 in order to justify the internment of Catholics without trial. 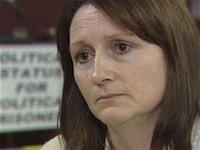 Unionists have reacted with anger at the involvement of a senior republican in the North’s Victims and Survivors Forum. The Austerity Treaty referendum has been passed in the official result at Dublin Castle this afternoon. Counting of ballots in the referendum on the European fiscal treaty has begun, and early indications are that the treaty will be approved.